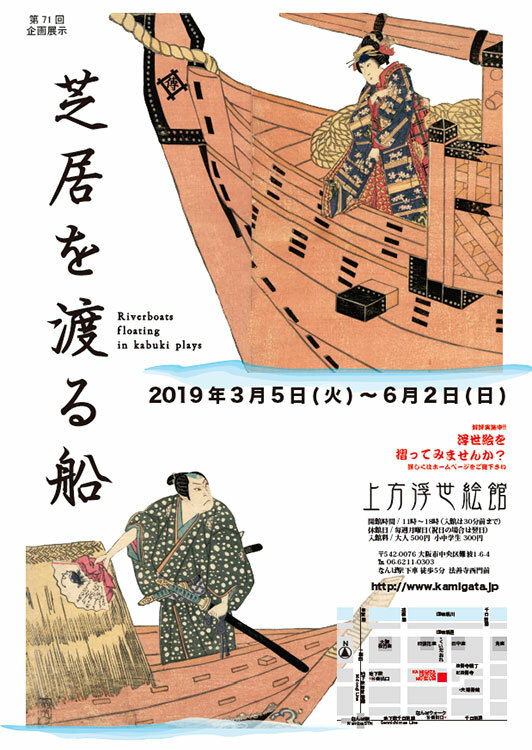 This museum exhibits Ukiyo-e prints and paintings produced in Osaka in the Edo period. While in Edo area there are many Ukiyo-e paintings of beautiful women and scenery, in Osaka area most of Ukiyo-e paintings are of portraits of Kabuki actors. 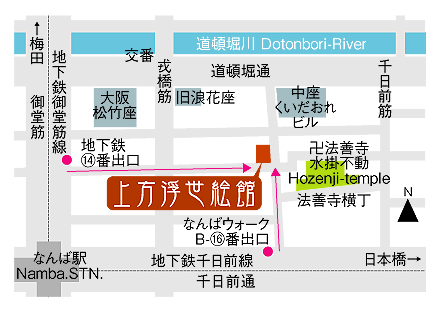 Dotombori was the area that Kabuki theatres gathered. This museum exhibits Ukiyo-e paintings of Kabuki actors who fascinated people in Dotombori in the Edo period. One of the characteristics of Kabuki is that it is played only by male actors. This means male actors play both female and male characters. Female roles in Kabuki are called onnagata. The actors have made every effort to express a woman’s heart. In this feature exhibition, we focus on “wives” in Kabuki plays. Male actors play roles of “affectionate wives” who bear hardships for their families, by whose performances people are impressed. Please enjoy Ukiyo-e paintings of onnagata actors who try to expresses the heart of the earnest wives or mothers. Kabuki plays can roughly be divided into two categories: jidai-mono (historical play) and sewa-mono (story about townsmen’s lives). In jidai-mono, most of the wives in plays are buke nyobo (samurais’ wives). They are also called “katahazushi”, the name comes from their hairstyle. Ukiyo-e paintings titled “Keisei rou daimon”, though its story now unknown, depicts a husband and wife in three continuous portraits. Thus the story is considered to be about the ties of the husband and wife. Strictly speaking, sewa nyobo (townsmen’s wives) means those who appear in the “sewa-yu” scenes in jidai-mono. They are characterized by the “Tobi-koku” kimonos, with a pattern of round – white –stones on a tobi-color background. Compare the appearances of samurais’ wives and townsmen’s wives. You can see samurais’ wives’ heart in their determined attitude and courage, while townsmen’s wives are gentle-mannered and tender-hearted. Mother’s love for the child is expressed in both jidai-mono and sewa-mono. In some plays the tragedy awaits her. kowakare (child separation) is the scene that depicts parents’ grief for having no choice but separate their small child. Based on the Kabuki play “Ashiya Doman Ouchi Kagami”, there is a Ukiyo-e that depicts a scene that a magical fox named Kuzu-no-ha tearfully makes her farewell to her child with Yasuna, her life-saver, when she must leave the son and go back to the forest after people found that she is not a human but a fox. In “migawari (child sacrifice)” scenes, mother’s heart wavers between the life that must be protected and the life of her child. In “Ichinotani futaba gunki”, Naozane beheads his own son, Kojiro, instead of killing Atsumori, Fuji-no-kata’s son, because Naozane is once rescued by Fuji-no-kata. The scene of grief of the father Naozane and the mother Sagami is depicted in Ukiyo-e. Feel the mother’s sorrow that is expressed through the separation with the child. There are many wives in Kabuki plays that bear the plight for her husband and family, even sacrifice their lives. In “Kokusenya Kassen”, Kishojo, a daughter of the former wife of Watonai’s father, kills herself to prevent her husband, Kanki, from standing Watonai’s side because of Watonai’s relations to Kishojo. And Watonai’s mother kills herself because she feels responsible for the suicide of Kishojo, a daughter of her husband’s former wife. These two women doesn’t hesitate to sacrifice themselves for their husband or family to reflourish their country. In “Hiragana Seisuiki”, a maid named Chidori, Kajiwara Genta’s lover, becomes a prostitute at a brothel in order to prepare money for Genta to take the battle field. Also in “Kanadehon Chushingura”, Okaru becomes a prostitute in order to help her lover, Kanpei, to succeed in life. In both stories, the women sacrifice themselves for their husband or lover, not minding themselves. A typical akuba wears checkered kimono with a ponytail-hairstyle. In “Osome hisamatsu ukina no yomiuri”, an akuba named Dote-no-oroku is a bad woman who extorts money from other people, but she does that from loyalty. She extorts money in order to make money for the family she once served to reflourish. Elderly woman role in Kabuki plays are called fuke oyama, or kashagata. Most famous fuke oyama in jidai-mono includes Kakuju in “Sugawara denju tenarai kagami”, which is one of “Tenjinki” stories (story about Sugawara Michizane. “Temmangu aijuno meiboku” is another famous “Tenjinki” story). When Kakuju finds that her son-in-law, Sukune Taro, is trying to kill her nephew Kanshojo, she finds that Sukune Taro also killed her daughter. Being a brave mother, Kakuju kills Sukune Taro. Copyright© Kamigata Ukiyoe Museum All Rights Reserved.